In order to keep up with overwhelming customer demand, Image Comics is sending SEVEN TO ETERNITY #1 written by Rick Remender, drawn by Jerome Opeña, and colored by Matt Hollingsworth back to print today, the same day as the issue’s release. In this breakout hit from the reunited creative team behind Uncanny X-Force, readers meet The God of Whispers. A dark tyrant who has spread an omnipresent paranoia to every corner of the kingdom of Zhal, The God of Whispers enlists spies who hide in every hall spreading mistrust and fear. Adam Osidis, a dying knight from a disgraced house, must choose between joining a hopeless band of magic users in their desperate bid to free their world of the evil God, or accepting his promise to give Adam everything his heart desires. Readers are invited on a hard road through the strange fantasy world of Zhal. All men have surrendered their freedom for fear. Now, one last free man must choose. 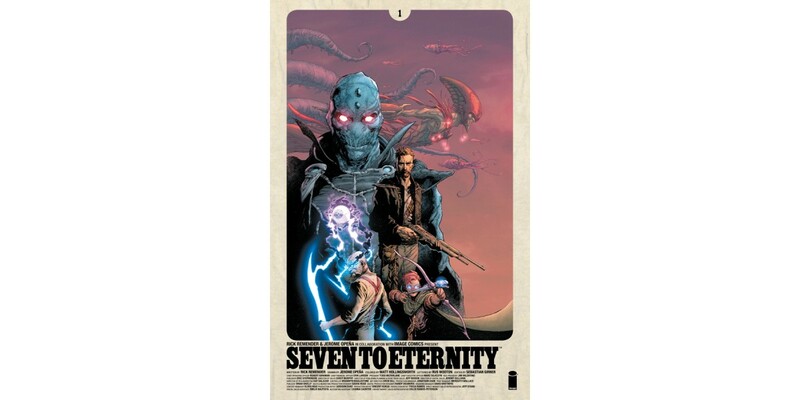 SEVEN TO ETERNITY #1 remains available for purchase across all digital platforms, including the Image Comics website (imagecomics.com), the official Image Comics iOS app, Comixology’s website (comixology.com), iOS, Android, and Google Play. SEVEN TO ETERNITY #1, 2nd printing (Diamond Code AUG168719) and SEVEN TO ETERNITY #2 Cover A by Opeña and Hollingsworth (Diamond Code AUG160661) and Cover B by Canete (Diamond Code AUG160662) will both be available on Wednesday, October 26th. The final order cutoff deadline for comics retailers is Monday, October 3rd.